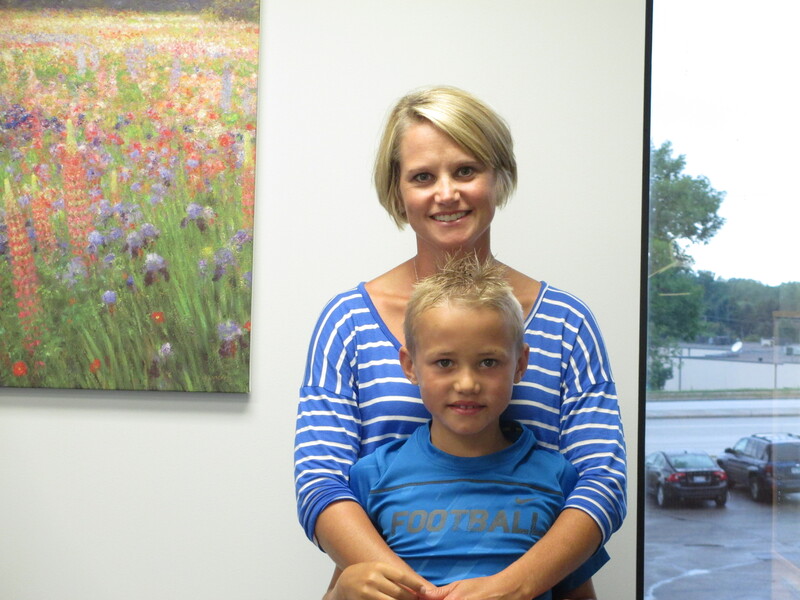 Caleb is a recent Vision Therapy graduate. He has made many incredible changes that his mom calls, “life changing.” Read his success story below AND check out their success VIDEO, too! These were common phrases said by our First Grader, Caleb. It would take us an hour or more to complete “simple” reading assignments. Just as he made up every excuse NOT to read, I made up excuses in my mind: maybe he was just a late developer…maybe he is just an active boy…maybe schools are asking too much of these young brains…maybe he is just not a “reader”. In Kindergarten and the first half of 1st Grade, reading was repetitious. There were a lot of sight words and small books that Caleb could easily memorize and “read”. When the reading assignments got longer, Caleb couldn’t keep up memorizing them as effectively. He was put into a remedial reading program and still struggled. It wasn’t until the summer, when we picked out our own reading material that I knew Caleb had an issue. But what was it?! He was jumping everywhere around the page. He couldn’t sound out words unless I wrote them on a separate piece of paper. He was repeating what he already had read. He couldn’t remember what he read. Both of us were frustrated and in tears. In August 2013, I panicked thinking there was no way Caleb was ready for 2nd Grade. It appeared he didn’t even have the basic fundamentals of reading down yet. I voiced my concern to a good friend of mine, and as I described the symptoms I was noticing, she recommended I take the symptom checker on the Minnesota Vision Therapy Center’s website. She was familiar with the Center after her niece and nephew had great success with the program. When I took the questionnaire, I had no idea how all the questions related, but was relieved to find out he qualified for an exam. Caleb completed 50 weeks of Vision Therapy. Was it painless? No. It was a commitment – it wasn’t easy doing homework every day, on top of his school work. Was it worth it? Yes! Just as with anything – you get out of it what you put into it. Was it life changing? Absolutely!!!!! We knew Caleb was a bright young boy but it wasn’t until after he went through Vision Therapy he gained his confidence in school. His reading has improved significantly – it doesn’t take as much effort, he has greater accuracy and his comprehension has developed dramatically. And when his national test results ranked him above his grade level in reading, you should have seen the smile on his face! He is no longer exhausted coming home from school like he was when his eyes and brain had to work extra hard to “keep up”. And…being a competitive eight year old boy, seeing an improvement in sports has been an awesome bonus! Caleb is currently active in football, hockey, lacrosse and baseball. Although he had never completely struggled with any of these sports, going through Vision Therapy definitely has helped. Tracking and following balls has become a reality, so the timing of catching, batting, passing, etc. all has started to click in a more influential way. His confidence has definitely been boosted on the playing field and on the ice rink. Do I recommend Vision Therapy to others who are struggling? YES!!!!! It is life changing in every way. I can’t begin to tell you how happy- and grateful – we are that we were introduced to Vision Therapy. There’s nothing better than experiencing such a powerful, positive change in one’s life…especially when it is your child’s life! Vision therapy is very important for that children who have difficulty on there vision. If you can identified this on early time,that really will be very good for future. The experience of this story is really awesome and interested. Thanks for sharing this.